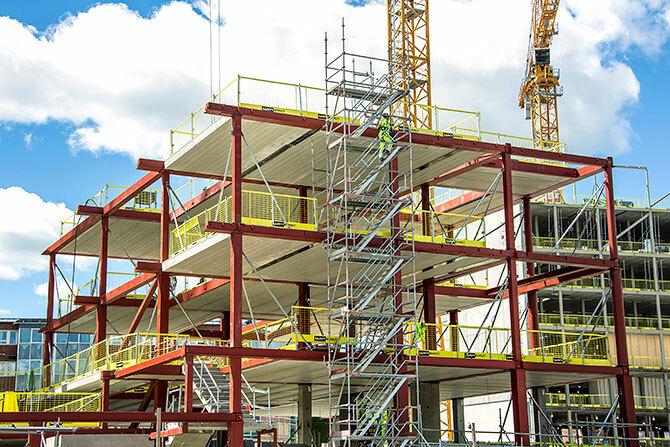 We are constantly developing new edge protection products, services and solutions in order to meet the requirements of creating safe working sites. A working method has been developed with which we already at the designing stage are present to develop solutions according to an established structure – an Edge Protection Analysis. We identify situations where a risk of falling may be present, and solutions are then specified already at the design stage. We co-operate with the project management, designers and local managers to create safe working sites. On the following pages you will find edge protection solutions that are adapted to different building methods and applying laws and norms. Our focus as experts is to be as close as possible to our customers and projects throughout the whole construction process, from edge protection analysis and estimates to training, delivery, installation and follow-up. Some products may not be available in your area at the moment. Please contact us for more information.